It's one of those horrifying facts of nature: Ant larvae eat each other. But why would a species that's famous for self-sacrifice and cooperation also support infant cannibalism? Scientists now believe it's sneaky interfamilial war. Ants will do almost anything to ensure the good of the colony. They will work themselves to death, drown themselves to create a path for their fellows, and even blow themselves up as defense for the hive. Which is why it's so strange that ant larvae engage in cannibalism. Hatched larvae will find eggs in their own nest and eat them to gain strength. The behavior is good for the larva doing the eating, but given the amount of effort that it takes to lay the egg and keep it safe, it's bad for the colony. What possible evolutionary benefit could this behavior have? 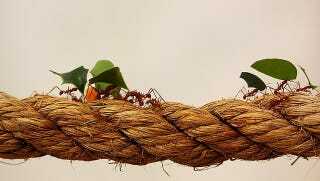 Scientists now believe that ant colonies are a more complicated than people realize. The key to the mystery of cannibalism was figuring out that the ants doing the cannibalizing were genetically complicated. Or, perhaps more accurately, the broods in which cannibalization occurred were genetically complicated. Ant eggs can come from many sources. Each brood of eggs can be full siblings, or half siblings, or from different parents altogether. When the degree of relatedness is high, cannibalism is low. When there are a bunch of eggs from different parents in a brood, suddenly the larvae start eating defenseless eggs. They focus on the defenseless eggs unrelated to themselves. These not-blood-siblings seem to be engaging in familial rivalry from the moment they hatch. It may not provide much benefit to the entire colony, but it can give each family within the colony an advantage. If they hatch early and eat everything that's not related to them, they can take over. The scientists also found that male larvae go cannibal more readily than female larvae. Exactly what is driving that behavior is still a mystery.